It’s a little bit silly to talk about a science-fiction film like Elysium being an allegory, because that’s almost a tautology; at its core, all science-fiction and fantasy is fundamentally allegory. Genres exploring other worlds—whether future, alien or imaginary—have always been ways for us to explore our own world. Tolkien knew it, Rod Serling knew it, Gene Roddenberry knew it, George Lucas knew it: We need a way to talk about heroism, injustice and our human struggles to do the right thing in a way that makes those ideas bigger than a political idea of the moment. We need something to remind us that the Big Questions are … well, big. 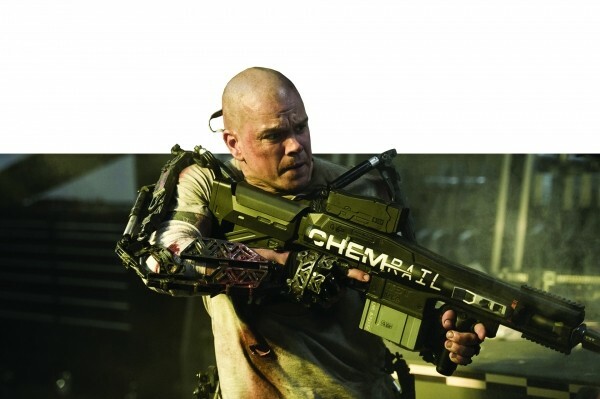 But there’s allegory, and then there’s the shoulder-shaking, rib-nudging, painfully strained storytelling that Neill Blomkamp throws at Elysium. As visually striking as Blomkamp makes his 22nd-century world, he never for a moment lets us forget that this is A Movie That Says Something Important About Our Time. Elysium, you see, posits a world where the 1-percenters don’t just live in their own world philosophically and in terms of lifestyle; they’ve literally left the planet behind. Orbiting above the Earth is the titular satellite/habitat, where those who can afford it enjoy the bliss of cure-all medical technology and breathable air, while the surface world has turned into one massive, overpopulated, disease- and pollution-ridden favela. Among the denizens of that world is Max Da Costa (Matt Damon), an ex-con trying to put his life back on the straight and narrow path—and, in one of the few subtle bits of plot business, is doing so working in a factory that literally builds the same robot cops that hassle him on the streets. Then Max gets exposed to a lethal dose of radiation doing that job, and his only chance of survival is finding a way to get up to the medical marvels of Elysium. Blomkamp made his name with the low-budget South African science-fiction tale District 9 a few years ago, and he brings the same gritty aesthetic to a bigger-budget enterprise. In a summer full of bloodless violence, it’s almost refreshing to find a movie that acknowledges genuine trauma to the human body—and when Blomkamp sets out to traumatize a human body, buddy, you’re gonna know it’s been traumatized. After Max seeks help from a one-time underworld running buddy (Wagner Moura) and winds up fitted with an exo-skeleton and an implanted computer chip in his brain, he emerges looking less like a superhero than like a bloodied high-tech science project. Yet as inventive as Elysium is to look at, it’s barely passable as something to think about. Where District 9 fully built its world as a unique metaphor for alien apartheid, Elysium trots out an extended riff on the immigration debate that doesn’t even bother to wrap the idea in new clothing. Earth residents employ the equivalent of coyotes to try to smuggle them to Elysium; the vessels full of “illegals” themselves are referred to as “undocumented ships”; the Elysium defense forces are identified as “Homeland Security.” Meanwhile, life on Elysium itself is addressed not at all; Blomkamp does no world-building for this world that had to be built, instead choosing to keep it a vague, idealized goal for the struggling Earth people, like Max’s childhood sweetheart and struggling single-mom nurse, Frey (Alice Braga). The only real focus on life on Elysium comes in the form of Jodie Foster, playing Elysium’s hawkish defense minister, Delacourt, in a performance so staggeringly terrible that it infects the rest of the movie. Snarling about needing to preserve their way of life for the children and attempting something that kind of sounds like an accent but maybe is just the sound of trying to swallow ridiculous dialogue, Foster never even bothers trying to make Delacourt more than a cartoon of militaristic xenophobia. Or perhaps she’s so generous an actor that she wants to make Sharlto Copley’s work as Delacourt’s demented, off-the-books contractor/assassin—which is, admittedly, at least fun in its craziness—look restrained by comparison.